Before your cruise can start, you have to get to the port first! If you’re from the Seattle area, that might not be a big deal. But if you are flying into Seattle-Tacoma International Airport, you likely need a little help in navigating from the airport to the cruise port. To help you find your way, we’ve put together this guide of all your options. The airport is about 15 miles south of the cruise ports, located in downtown Seattle. The trip is a 20-30 minutes ride, depending on traffic. Fortunately, there are plenty of options for reaching the port, even if you don’t have a car. In a tech-hub like Seattle, it’s only right that the best way to get to the cruise port is using a rideshare service like Uber or Lyft. Both Uber and Lyft operate legally in Seattle, providing a convenient way for people to get from the airport — or anywhere else — to the cruise port. The ride-share services estimate a cost of $32 from the airport to Pier 91 (the further of the two cruise terminals), so it is cheaper than taking a cab. In addition, since this is a private ride, you can ask your driver to make stops on the way if you forgot anything or want to pick up some snacks before the cruise. For more details on using Uber/Lyft to the Port of Seattle (including price estimates), visit our page on the topic. The cruise lines themselves are happy to give you a ride to the port, for a charge. For instance, Carnival offers a round-trip ride for $54 per person. 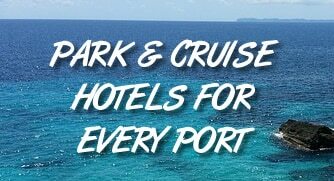 While these rides offer some protection and convenience (since they are affiliated with the cruise line, you don’t have to worry about missing the boat), they can be quite expensive, especially when traveling with larger groups or families. As well, they can be somewhat restrictive since they normally operate only for a few hours on the day of departure/arrival and only go back and forth between the airport and cruise port. If you are arriving a day early or leaving later to give yourself time to explore the city, then the cruise line transfers won’t work for you. For this reason, we suggest using alternative forms of transportation. If you are still interested, here are some recently quoted prices based on cruise lines. Note that you cannot ride on another company’s shuttle if you aren’t cruising on their ship. A few shuttle services have popped up in recent years to help you get from the airport to the cruise port. These services offer either private or shared service. Shuttle Express: Offers dedicated service between the airport and cruise port. For just $22 each way per person ($44 roundtrip), this is one of the most affordable options to get back and forth. If you are staying at a hotel in the area, you can also arrange them to give you a ride there instead. Capital Aeroporter: Has private service that costs $100 each way ($200 roundtrip) between the airport and cruise port. While that seems expensive, the price is good for up to five adult passengers. A sixth passenger increases the price $30 roundtrip. SpeediShuttle: Offers shared rides on a passenger van between the airport and Pier 66 for as little as $16 per person each way. Rides to Pier 91 are just $21 per person. Aces Town Car Service: While not necessarily focused on the cruise niche, Aces offers service from the airport to anywhere in town. Rates run about $60 each way for trips to the port, for up to three adults in a private luxury sedan. Seattle Shuttle: Family-owned and operated shuttle service offering passenger van transportation to the cruise ports or Seattle hotels. If you’re wanting to take a taxi, it offers one of the easiest ways of getting to the Seattle cruise ports, but we’d still favor using Uber or Lyft over a regular cab. Seattle Yellow Cab is the most visible company in the city and has stands in the Sea-Tac International Airport. In general, expect to pay $40-60 each way to get to the port for two adults. More than two adults will see a small additional charge, but minors don’t count (perfect for a family heading on a cruise). Seattle Yellow Cab does offer a $40 flat rate from downtown Seattle back to the airport. This zone covers the Pier 66 cruise terminal, however, the Pier 91 terminal is out of the flat-rate zone. In general, we suggest budgeting $120 round-trip for a couple using a cab. Flat-rate taxis are also available, with an ahead-of-time reservation. These cars are like a cross between traditional cabs and Uber/Lyft. You reserve ahead of time and a car will be sent to meet you. Then you pay a flat-rate for your destination. Right now rates are $29 to downtown from the airport, making it one of the cheapest ways to get to the city. Check out East Side For Hire or Flat-Rate For Hire. If you want to have a little more freedom to explore, you can always rent a car, giving you the ability to go anywhere you like before or after your cruise. All the major car rental companies are available at the airport, and we’ve found rates as low as $20 per day. Of course, if you rent a car you will have to pay to park it at the port once you get there. Seattle port parking runs at least $20 per day. You can take the Link Light Rail from the airport to downtown Seattle. It costs $2-3. how long does the light rail take to get down town? About an hour to get to the cruise port. It’s a 40 minute ride and then a 20 minute walk from the station to Pier 66 according to Google. where can I find $20.00 per day for car rental near airport? can I take the light rail from airport to downtown then take a cab to the cruise terminal? And you can absolutely take the light rail to downtown and then catch a cab… or walk. We have a cruise coming up and will need to get a car to get us to the cruise ship itself. I love the solutions you offer and hadn’t really considered that the port could even be 20 or 30 minutes from the airport, or further depending on where your cruise leaves from. I found your section on hiring a private shuttle service to be very helpful because they can be very affordable compared to a lot of other options. Thanks for the tip.